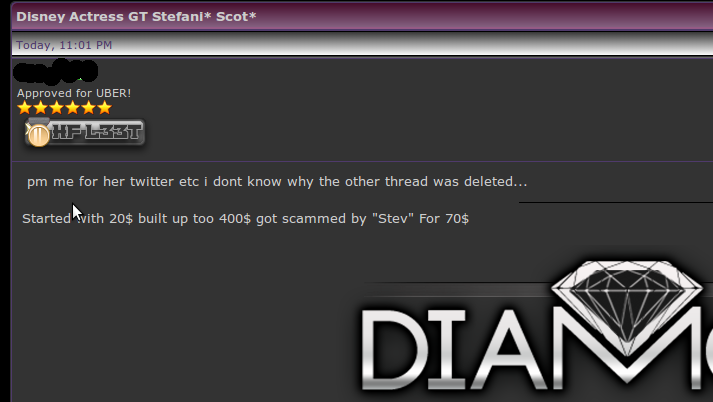 A recent post on an underground hacking forum claimed to sell the Twitter account of the actress "Stefanie Scott" . This is one of the rare time's the attack can be prevented before it happens so I am releasing this post in public interest.And to show how such celebrity accounts are sold by hackers. Now lets analyze the post . First I am worried by his statement of "pm me for her twitter ETC" which point's that he is in control of MORE than her twitter account. And she seems oblivious to the fact that her account's might be hijacked because she tweeted about an hour ago and the sales thread has been opened way before that . As you can see such accounts can go for 400$ or more .The account has 256,211 followers which is worth a lot.Most such hacks don't affect the celebrities as much as the followers whose computers or accounts might be hijacked as the result of following the links posted by a hacker posing as the celebrity. It is the responsibility of the celebrity to keep his/her account safe as they are not the only people affected, their fans often take the worst side of the attack. PS: This might just be a scam by the user to rip off other users but it seems unlikely since he is a higher level of user and would not like "scam reports" to be opened against him.I will update this article if I get more information.